When you look back, I bet you can pick out at least one or two moments that were the life-defining kind. For me, a few things stand out. 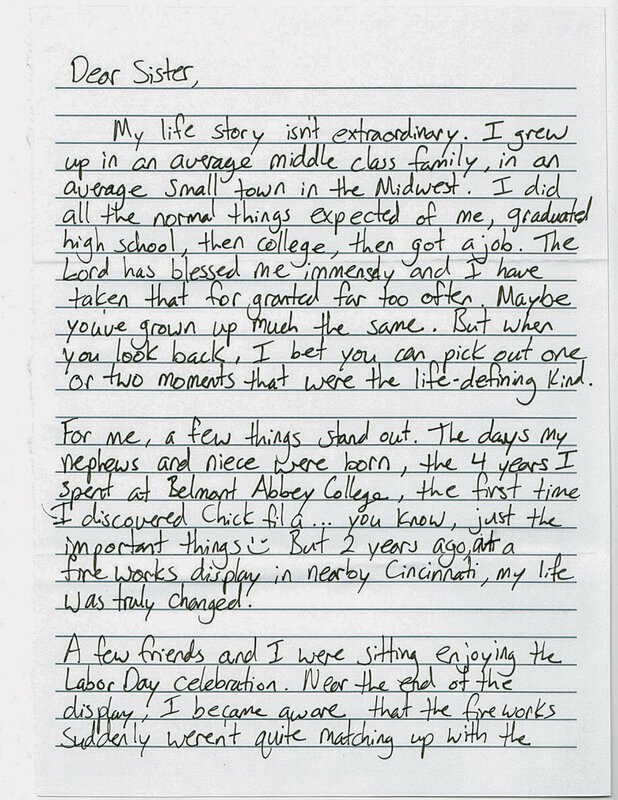 …two years ago, at a fireworks display in the nearby city of Cincinnati, my life was truly changed. My life story isn’t extraordinary. I grew up in an average middle class family, in an average small town in the Midwest. I did all the normal things expected of me, graduated high school, then college, then got a job. The Lord has blessed me immensely, and I have taken that for granted far too often. Maybe you’ve grown up much the same. But when you look back, I bet you can pick out at least one or two moments that were the life-defining kind. For me, a few things stand out. The days my nephews and niece were born, the four years I spent at Belmont Abbey College, the first time I discovered Chick Fil A... you know, just the important things. But two years ago, at a fireworks display in the nearby city of Cincinnati, my life was truly changed. A few friends and I were sitting and enjoying the Labor Day celebration. Near the end of the display, I became aware that the fireworks suddenly weren’t quite matching up with the popping sounds. I brushed it off at first, but as the finale came to a close, the popping sounds did not. It was as if everyone in the crowd realized at the same exact moment that the popping noise was, in fact, gunfire. In unison, everyone began to surge away from the noise. You could almost taste the fear in the air. We got down on the ground and avoided being stepped on the best we could, until we could get our bearings and make our way out of the melee. We were probably there less than a minute, but I honestly could not be sure. Was this a terror attack? Who would tell my parents if I didn’t make it? Had I fulfilled my purpose in my time here? I could actually die, right now. And I prayed, silently, without even using words, just praying with my heart. In that moment, everything outside of me felt like slow motion, while thoughts raced through my mind. Was this a terror attack? Who would tell my parents if I didn’t make it? Had I fulfilled my purpose in my time here? I could actually die, right now. And I prayed, silently, without even using words, just praying with my heart. I distinctly remember each of these thoughts, as though it happened yesterday. I remember the shots ending, getting up to run out of there, looking back, seeing someone laying on the ground, and first responders rushing in. At that point in time, we had absolutely no idea whether this was a simple disagreement, a terror attack, or any number of other possibilities. Sisters, we have such limited time here, truly, and tomorrow is NEVER promised. I just want to remind you today, to be fearless. To live each moment for God, and trusting in His goodness. As it turns out, it was gang related, and directed at one person. The boy who was shot lived, and had no life altering injuries. To this day, I believe it was a miracle that six shots were fired, and no one else in that throng of onlookers was injured or killed. Of course, I wish the event had never had to happen. But during that moment in which, for the first time really, I thought I might actually not see tomorrow, my perspective was changed forever. By nature, I get nervous about pretty much anything and everything. I fake it pretty well (sometimes), but I don’t like stepping outside my comfort zone. Like, at all. While I still have that tendency, I always come back to that one particular question. Have I fulfilled my purpose here on Earth? Sisters, we have such limited time here, truly, and tomorrow is NEVER promised. I just want to remind you today, to be fearless. To live each moment for God, and trusting in His goodness. So let’s make the most of today, and start small. Just love those around us. Make someone smile. Send a note to a friend you’ve lost touch with. Pray a little extra. Start saving for that trip you’ve always wanted to take. But most of all, let’s just be. Be His daughters. You know, right now, my life doesn’t look exactly like I planned, and I bet yours doesn’t either. It’s not perfect, and heck, I mess up a LOT. But I know that when that moment does come, when my time is up, and I have to ask myself that question again, I want to hear my Master to smile at me and say, “well done my good and faithful servant.” So let’s make the most of today, and start small. Just love those around us. Make someone smile. Send a note to a friend you’ve lost touch with. Pray a little extra. Start saving for that trip you’ve always wanted to take. But most of all, let’s just be. Be His daughters. Rest in His love, and do His work, however that looks in each of our lives. PS - I’d like to take this opportunity to say THANK YOU to all of our military, active and retired, our first responders, and their families. I will never forget watching them rush in to take care of the situation, as the rest of us rushed out. My small story can in no way compare to the danger they put themselves in voluntarily, to protect us, every single day. Thank you, and God bless you all! Hi y’all! I’m a single, 28 year old Midwest girl, that goes by Bridget, or any number of variations of that. My happy things are Jesus, Chick-fil-a, my family, blogging and fitness! I work as a business manager for a PT office, and I love what I do.